Remember our bathroom update that I posted here? Well, I stocked up at my mecca, The Container Store and went to town in there. I like to keep countertops clear. This is all we have on ours. 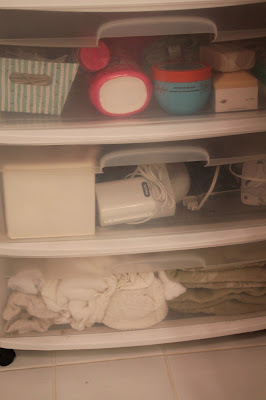 I am actually trying to find ways to hide the cotton pouf and q tip holders. OCD much? This is my drawer. Not often used hair tools, toothpaste, derma roller and a spot for buttons of pins. This is looking under our sink. It looks busy but it makes sense! I found this awesome holder at Target for all of my nail products. I keep my straightener, hair dryer and curling iron underneath. Behind are dog shampoo, Woolite and rubbing alcohol. Next to them in a little $1 container from Target are lady things. Ahem. Run out and buy yourself one of these organizers for your nail supplies, makeup or you desk. They're near the make up bags in Target and they are AWESOME. 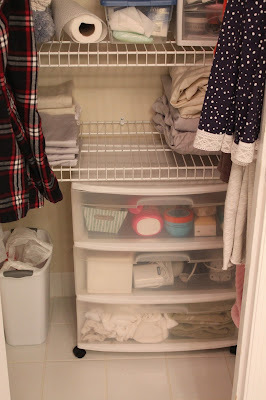 I used a kitchen Lazy Susan to put things like face masks, hair products, and a lint roller. This is SO handy! This is on the inside of our closet door because we have a closet in our bathroom. Weird and useful at the same time. I keep my hair goods in here. 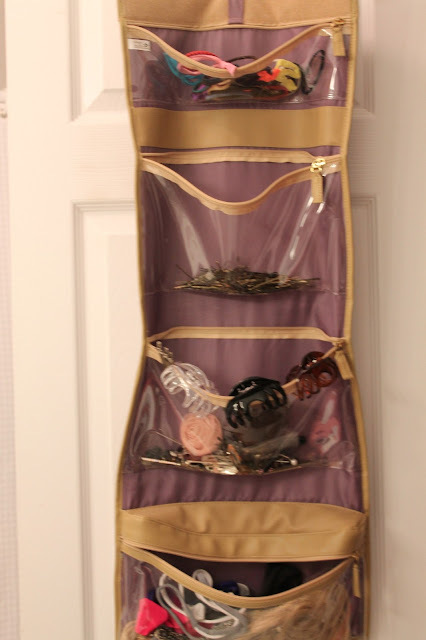 There are hair ties in the top, bobby pins, clips, and head bands in the following pockets. This is just a random hanging travel bag that I found and liked. I use this three drawer organizer for travel size items and extra make up. I use a large three drawer organizer for extra bathroom supplies, rarely used electronics, wash cloths and cleaning rags. The whole closet. Sheets go on the bottom shelf and Josh and I each have a side with hooks for robes, jammies, etc. So that is that! It needs some serious tweaking, but it is working for us for now! Chances are I will go a smidge crazy one day and toss half of this stuff and de-clutter further so be forewarned! I love an organized bathroom! I am on such a lazy susan kick lately, they're so handy! I want to see yours!